Has art gallery boom paid off? Over the past decade, bold and costly new art galleries have sprung up in towns from Margate to Middlesbrough in the hope of regenerating underloved areas and bringing modern art to the masses. Has the strategy worked? Ten years ago on Friday, an old flour mill on the banks of the River Tyne was reborn as a temple to modern art when Gateshead's Baltic gallery opened its doors. The £46m Baltic and its neighbour the Sage, a futuristic Norman Foster-designed concert hall, have become city landmarks. But as well as cultural venues, they are monuments to the metamorphoses cities like Newcastle and Gateshead have gone through since the steam and soot of heavy industry subsided. The Baltic and Sage demonstrate how "cultural investment" can regenerate an area, according to Baltic director Godfrey Worsdale, who points to new hotels, a design centre and college that have sprung up in their shadows. "Whilst the major cultural venues in Newcastle and Gateshead do demand almost £20m a year from the public purse to operate," he says, "we know that the return into the regional economy is something like £80m. "So it's a massive injection of resource into the regional economy and that has obviously created very significant numbers of opportunities for the local population." The Baltic and Sage do not just represent bricks-and-mortar renovation, but have also changed the atmosphere and the way people feel about the city, he believes. The Baltic attracts about 400,000 visits per year, including a dedicated audience of 80,000 who now come to every exhibition. It was among the new British galleries that followed in the wake of the Guggenheim in Bilbao, Spain, which reinvented the former port city when it opened in 1997. The "Bilbao effect" was then chased by the Nottingham Contemporary, the Middlesbrough Institute of Modern Art (Mima), the Towner in Eastbourne, the Public in West Bromwich, the Turner Contemporary in Margate, the Hepworth Wakefield and Firstsite in Colchester. Between them, they cost £195m to build. In Middlesbrough, Mima celebrated its fifth birthday in January and the striking building was intended to provide a focal point for the central square. But, surrounded by uniformly ugly office blocks, a row of empty shop units and a couple of Georgian council buildings, the glass-fronted gallery could have been beamed in from another planet. Mima has earned a good reputation in the art world but costs £1m a year to the council, which is having its budget cut by £50m over the next four years. In 2010, the town was ranked as the least able place in the country to cope with economic shocks like public sector cuts. The local jury seems to still be considering its verdict on whether the gallery has been a good thing. When asked whether it has made Middlesbrough a more desirable place to live, a lady in a local estate agent answers: "It's neither here nor there. "I suppose it's something nice to look at in the middle of this mess." She declined to be identified. Lots of people in the town centre look blankly when asked what impact Mima has made and say modern art is not their cup of tea. A newspaper seller called Alan declares it "a waste of money", adding: "They could spend however much millions of pounds on maybe getting something for the kids. Like the swimming baths that used to be in Middlesbrough." The only indication of the gallery's knock-on effect on the nearby row of empty shops is a sign for a pop-up "art and performance space" called We Are Open, which is decidedly not. But there are other, subtle changes. "There's an element of town pride that goes along with having something that isn't Middlesbrough, known for the smoke, the pollution, the general urban decay," says Chris Neale, a bank worker on his lunch break in the square. And at the railway station, a smaller gallery space called Platform A has been open for a year alongside studios for 15 artists. Artist and founder Tony Charles says Mima's arrival made others realise that the council was receptive to creative ideas. It has also given the university's fine art graduates a reason to stick around. "Since we've become established here, we can see other people following our example and starting to set things up themselves," he says. "It all contributes to the creative maturing process of Middlesbrough. "Now, it's not unusual to be talking to an artist in Middlesbrough in the middle of the street. There are plenty of them. Whereas years ago, before Mima, they were a rare breed." Two of the most recent additions to the gallery circuit are the Hepworth Wakefield and Turner Contemporary in Margate, both designed by David Chipperfield, which each boasted 500,000 visitors in their first years - far exceeding expectations. But are those visitors also spending time and money in the area, or just visiting the galleries before going straight home? In Wakefield, the gallery estimates that its visitors each spent an average of £20 in the town, bringing in £10m to the local economy. Wakefield Express editor Mark Bradley says opinion in the city is still not "unequivocally positive", but that the gallery has won over many critics. "I've been into various shops in Wakey - sandwich shops, coffee shops, places like that - where they've said that they have had people that aren't from Wakefield discussing their visit to the Hepworth. "At the outset, there were a lot of people saying 'People are just going to go to the Hepworth and then leave Wakefield'. But I don't believe that's true. I think a lot of people are sticking around a bit." 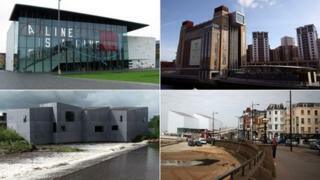 High-profile galleries may offer a "very quick visible fix" for councils looking to address problems, according to Professor Malcolm Miles of the University of Plymouth, but they cannot make much difference on their own. There must be other attractions to draw in visitors, and other forms of regeneration to really improve an area, he believes. The New Art Gallery in Walsall, which opened in 2000, is one that struggled in its early years. "The time I went there, I was the only visitor for quite a long period," Professor Miles says. "The building really stands out in the environment around it as the only element of regeneration there. It's too isolated. "And it's so near Birmingham, which has a lot more. People will go into Birmingham and not Walsall. Which is a pity because there were a lot of positive aspects about the building and what's inside it. These are well intentioned initiatives but they're sometimes rather naive." New Art Gallery director Stephen Snoddy says the venue had 175,000 visitors in 2011 and that new flats, shops and a hotel had now been built nearby. The new galleries have certainly loosened London's monopoly on contemporary art. Funding from councils and other sources is being squeezed, though, and Arts Council England has decided to focus capital money on improving existing buildings rather than putting up new ones. The galleries from Wakefield to Margate are among the last of their generation, and must now prove their worth in the long run, just as the Baltic appears to be doing.